The Burmilla is adventurous but a bit of a klutz, so put away breakables when he is around. See all Burmilla cat characteristics below! The Burmilla is another example of the accidental creation of a new cat breed. The unplanned mating between a Burmese and a chinchilla Persian in England in 1981 produced four black shaded female kittens with short, thick coats. The breeder realized how attractive such a breed could be and went on to develop what became known as the Burmilla. The Burmilla is recognized by Britain’s Governing Council of the Cat Fancy and Europe’s Federation Internationale Feline. 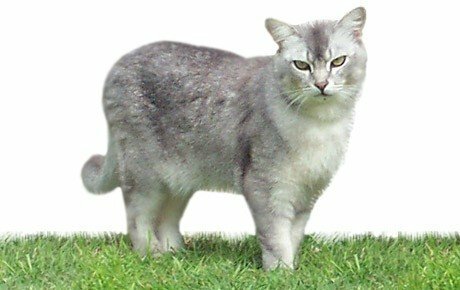 The breed entered the Cat Fanciers Association Miscellaneous Class in February 2011. The Burmilla brings together aspects of the Burmese and the Persian into one sweet, friendly package. He is quietly affectionate and gentle but more extroverted than the typical Persian. He is adventurous but a bit of a klutz, so put away breakables when he is around. Burmillas remain playful into adulthood. They love their people, but they aren’t excessively demanding of attention. When a lap is available, though, the Burmilla is there. The Burmilla’s short, smooth coat is simple to groom with weekly brushing or combing to remove dead hairs. A bath is rarely necessary. Brush or comb a longhaired Burmilla two or three times a week. Brush the teeth to prevent periodontal disease. Daily dental hygiene is best, but weekly brushing is better than nothing. Trim the nails weekly. Wipe the corners of the eyes with a soft, damp cloth to remove any discharge. Use a separate area of the cloth for each eye so you don’t run the risk of spreading any infection. It’s a good idea to keep a Burmilla as an indoor-only cat to protect him from diseases spread by other cats, attacks by dogs or coyotes, and the other dangers that face cats who go outdoors, such as being hit by a car. Burmillas who go outdoors also run the risk of being stolen by someone who would like to have such a beautiful cat without paying for it. Besides their sweet personalities, Burmillas stand out for their coats, which have a silver-white background color that is tipped or shaded with a contrasting color. In Burmillas with a tipped pattern, the color tips about 1/8 of the entire hair length and is evenly distributed, giving the coat a sparkling appearance. Burmillas with tipped coats generally look lighter than Burmillas with shaded coats. In the shaded pattern, about 1/3 of the hair shaft is shaded, which is why the shaded cats look darker. Colors in both tipped and shaded patterns include black, brown, lilac, blue, chocolate, cream, red and tortoiseshell. The silky coat can be shorthaired or longhaired. Longhairs may have ear tufts and a fully plumed tail. In all other respects, they look much like the European Burmese with a gently rounded head that tapers to a short, blunt wedge; medium-size to large ears with slightly rounded tips that tilt forward a bit; large eyes that can be any shade of green; and a medium-size body with slender legs, neat oval paws, and a tail that tapers to a rounded tip. The gentle and playful Burmilla is well suited to life with families with children and cat-friendly dogs. He can learn tricks, enjoys interactive toys, and loves the attention he receives from children who treat him politely and with respect. Supervise young children and show them how to pet the cat nicely. Instead of holding or carrying the cat, have them sit on the floor and pet him. Always introduce any pets, even other cats, slowly and in a controlled setting.